UPDATE: Thank you to everyone who attended, volunteered and donated at our first benefit event. We have posted photos from our wonderful photographer Richard Lawrence here; enjoy! 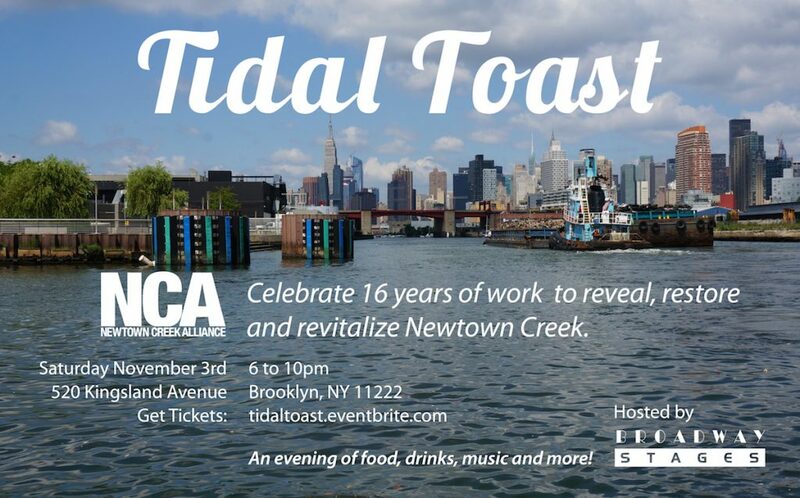 Since 2002 the Newtown Creek Alliance (NCA) has been the voice of Newtown Creek; working with industry, agencies, and residents alike to promote awareness, remediation, access, resilient businesses and ecological restoration. This celebration will champion the Vision for the future of the waterway and those that have contributed their time, energy and effort to it. Join us and your neighbors for a celebratory event hosted by Broadway Stages. The evening will feature tours of the Kingsland Wildflowers green roof, an open bar, local food and music, as well as presentations showcasing NCA’s ongoing projects and a silent auction with some amazing items to help support our vital programming. Come celebrate our 16 years of achievement and support the ever important work ahead of us. Together we can restore our waterway and create a future we can all be proud of.